In the early 1980s Sun Microsystems begin producing high-end Unix based workstations that competed with the Xerox Star, Perq, Apollo, and Apple Lisa. It is important to note that Sun workstations were not targeted for sale to the average individual, but rather to large businesses to run high powered programs and to compliment Sun server hardware. 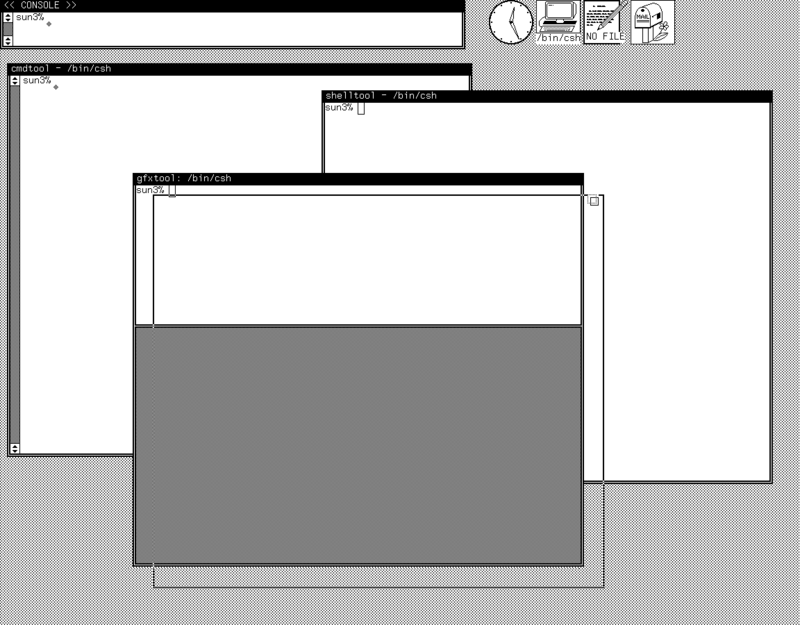 SunOS, later renamed to Solaris, is the operating system the early workstations ran. 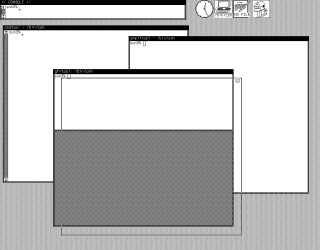 Thanks to the "The Machine Emulator" (TME) I was able to get some screen shots of these early Sun GUIs. This version of Suntools/SunView is from SunOS 3.5, although I kind of cheated. I could not get SunOS 3.5 to run under TME. When trying to boot the 3.5 mini-root for installation it would fail to recognize the hard disk giving the error si0: si_arb_sel: never won arbitration. So instead I took SunOS 4.1.1 and dropped the SunOS 3.5 SunView files on to the install tapes. (Yes, on a real Sun SunOS 3.5 and 4.1.1 were loaded from TAPE). Surprisingly it mostly works. This is the default Suntools/SunView desktop. By default it always starts the clock, a terminal, an editor, and the mail program. The console window displays text messages generated by other programs that only appear on the text console. The menu to start other programs is accessed by right-clicking on the desktop. As far as I can tell, no graphical file manager is included with this version. I'm not really sure which name to call it for this version. In the right-click menu it refers to itself as "Suntools" but the tape index calls it "SunView". This version of Suntools/SunView was released in 1987. It is not really clear when Suntools was originally created. Reportedly even the original 1982 Sun-1 had optional graphics ability, but Suntools was almost certainly introduced much later (1985?). It is also not entirely clear if this version is supposed to be able to display in color or not. TME 0.6's color graphics emulation does not appear to work properly in Sun-3 emulation mode. Suntools/SunView comes with an e-mail program that makes use of the built in Unix mail system. It also includes an icon editor. Right-clicking on the title bar brings up a menu for manipulating the window. In this environment, "Close" is the term used for reducing a window to an icon - this does not terminate the application. The "Quit" option is used to terminate an application. "Expose" and "Hide" move windows to the front or back respectively. "Move" and "Resize" bring up a dialog like this that begins the process of moving or resizing the window. Dialogs here do not have visual buttons to press. Instead they respond to pressing different buttons on the Sun three-button mouse. Windows can also be moved by clicking in the corners with the middle mouse button and dragging. Interestingly clicking in the middle of the edge of a window will only let you move up/down or left/right. Windows can be dragged to the edges of the screen, but can not be positioned so that any part of the window is off of the screen. Normally, this environment would be used with a three button mouse. The left mouse button usually activates or selects, the middle is usually used for text selection, and the right mouse button usually brings up menus. Using this environment I am constantly finding myself fiddling with the mouse buttons trying to figure out which button needs to be pressed for what. This is the "Defaults" screen. It is essentially a control panel and can change a few behaviors of the environment. For example, when programs are "closed" (reduced to an icon), they normally appear in the upper left, covering the default position of the console window. From here icons can be made to appear in other corners. This screen shot also show several performance monitors running.